Background: The most common form of a short lower face is of the horizontal dimension. The chin is seen to be short and is positioned behind the forward position of the lower lip to varying degrees. Depending upon its severity there may be a malocclusion of the Class II variety. All methods of such jaw shortening are done by various forms of horizontal augmentation. A less common form of lower facial shortening is in the vertical dimension. The jaw is vertically short and is seen by the existence of a zero or near zero mandibular plane angle. This means that the bony position of the chin and the jaw angles are at the same horizontal level. While it is possible that the chin position is vertically normal and the jaw angles are too long, much more frequently the jaw angles are closer to normal in length and the chin is vertically short. This is most evident by assessing the anterior facial third measurements or the vertical length of the chin just looks short. While the occlusion may have a normal bite relationship, it is just as likely that there is some degree of an overbite relationship…even up to a 100% overbite. The treatment for a vertically short lower face, barring orthognathic surgery if indicated, is inferior border jawline lengthening. In some case this may only be done anteriorly at the chin with a vertical wedge opening bony genioplasty with or without an interpositional graft. When the chin comes down the mandibular plane angle is increased. But if the entire jawline needs lengthened only a custom jawline implant can create the effect. Case Study: This male was bothered by his short lower face. He has an edge-to-edge occlusion with some overate. 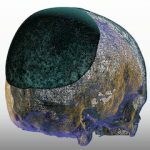 His 3D CT scan showed a zero mandibular plane angle with a 90 degree shape to his jaw angles. From the 3D CT scan a vertically lengthening jawline implant was hand fashioned out of clay to create a non-uniform vertical jawline lengthening (chin longer than the jaw angles) with a central vertical chin cleft. The clay model was then converted into a solid silicone implant by the manufacturer. Under general anesthesia and through a submental incision the jawline pocket was made back to the jaw angles. 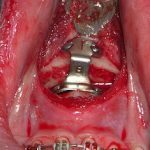 Intraoral incisions were then used to properly make the jaw angle implant pockets, connect it to the chin pocket and placed the implant as intended. Screw fixation was used at all three bony ‘corners’. While today the implant would have been created by a computer designing process, the concept of vertical jawline lengthening remains the same and just as effective. 1) A vertically short lower face is typified by a zero mandibular plane angle. 2) The most effective method of aesthetic vertical facial lengthening is a custom jawline implant that drops down the entire inferior border of the mandible. 3) The placement of such a jawline implant is through a sib mental incision supplemented with intraoral incisions to verify positioning and establish stabilization.